Self-interdiction and then an abdication by the Awami National Party (ANP) in favor of its nemesis -the Taliban is obvious, but one ANP leader stands taller than the mountains of his native Swat, against the bloody scepters of the untitled Jihadist tyrants. At the other end of my phone call today was an unmistakable deep voice, with an inimitable Pashto diction that many of us from the North West Frontier Province (NWFP) of Pakistan, would readily recognize. Muhammad Afzal Khan of Droshkhela, Swat sounded calm, composed and firm in his resolve to deny a military or moral victory to the Taliban who have unleashed terror on our province. He expressed his resolve to remain in what he described as his fortified house. 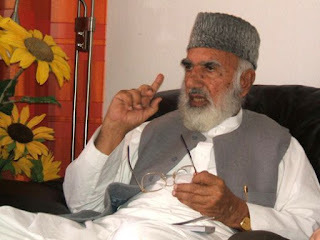 How I can leave my family spread over five villages and my people all over Swat, questioned Khan Lala, as the veteran Pashtun nationalist is called with affectionate reverence. General Janjua, a military doctor, had recommended for Afzal Khan to be evacuated out of Swat for a medical condition, which he has had since 1994, but too proud to turn his back on his people, the Khan declined. Afzal Khan talked about his meeting with the Pakistan Army Chief, General Ashfaq Kiyani with palpable skepticism. “I told the Army Chief that the Swatis feel that they are being killed by the Taliban and the Army both”.”Give me a reason to explain to the Swatis that this is not true”.”The Chief didn’t say anything”, said Afzal Khan. Known for his moderate views towards the State of Pakistan, of which he has remained a Federal Minister, member of the National Assembly, deputy opposition leader and contestant of a presidential election, Afzal Khan sounded intrigued at the inaction of the Pakistan’s security apparatus. He however reserved his deepest concerns for his own party, the ANP. Afzal Khan said that he has conveyed his displeasure at the so called peace agreement, to the Chief Minister of the NWFP, Amir Haider Hoti. “I asked Haider Khan Hoti, where are the Swatis in this whole deal”, “you never asked us about our opinion”, said Afzal Khan. I asked Lala as to what he thought of a mutual friend of ours who is at the helm in the ANP.”Don’t you think he misled Dr. Najibullah, as an advisor, and now is repeating the same mistakes on our side of the Durand Line”, I tried to prod him. Afzal Khan chuckled but opted not to answer this question directly. He went on to talk about how the Swatis, having elected the ANP candidates on all seven provincial assembly seats, feel disenfranchised after the deal. He relayed his fear that this lull is providing the Taliban the respite they required to rearm and regroup to extend their attacks outside Swat. “Look, all that the ANP deal has done is to give the Taliban a reprieve from fighting here and now they are in Buner and Shangla”, he lamented. “Afrasiab Khattak and Iftikhar Hussain (ANP’s provincial president and information minister, respectively) came to see me, escorted by government security agencies”, said Afzal Khan. “I told them that the first priority of the state is to provide security to the citizenry, but you chose to remove the security away from the Swatis and yet have it for yourselves”, he concluded. Last year, the ANP had rebuked its leaders like Lateef Afridi, who had suggested a march to Swat and a show of strength, in support of Afzal Khan and the Swatis. Many in the ANP believe that the current leadership is wary of Afzal Khan because he has achieved a larger than life stature and probably ranks right up there with Mir Wais Hotak, Khushal Khattak and Ahmed Shah Durrani.